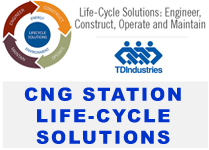 Home » CNG Conversion Kit » Who Benefits with CNG Conversion? The time has come to convert your fleet vehicles to clean burning natural gas. Why pay for the increasingly high cost of gasoline due to foreign oil interests when you can use domestically produced natural gas? Fleet owners, businesses, Federal, State and Local Governments benefit from the substantial cost savings as well as the positive environmental impact through the use of clean burning natural gas. There are a number of grants and incentives available. Gasoline-powered vehicles are easily converted by adding CNG components that make natural gas the primary fuel. Storage cylinders are installed either in the trunk of a car or underneath vans or pick-up trucks. Stainless steel lines are run from the tanks to a regulator that will reduce the pressure of the gas stored on-board. The natural gas then passes through a fuel-air mixer and then into the air intake manifold where it is introduced for combustion. A fuel selection switch is installed on the dash to allow the driver to switch between natural gas and gasoline. Four key features make CNG a safer fuel than petrol, diesel or LPG. With specific gravity of 0.587, it is lighter than air so in case of leaks, it rises up and dissipates into air. (Other fuels form puddles on the ground in case of leaks.) CNG has a 700 degree Centigrade ignition temperature compared to 455 degree Centigrade for petrol. The range of 4 to 14 per cent in which CNG mixes with air by volume for combustion is small. Storage is far safer than for petrol, as CNG cylinders are designed and built from special materials and to high safety specifications. Anyone who drives close to 100 miles a day ! 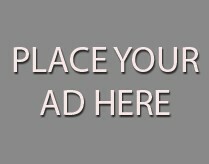 The cost of conversions is EXPENSIVE! Vehicle managers need to make the business case to justify the conversion by showing either enough tax credits or operational cost savings or a combination of the two. Look at how much fuel you are using in your vehicle. CNG is usually less expensive than Gasoline – usually ranging from 0.60 to as much as $3.00 per gallon! The more fuel you burn over the life of the vehicle, the more you will save by switching to CNG. For this reason, ideal customers are those that use big engines and burn lots of fuel. Typical vehicles that are converted are full-size pick-up trucks and vans that run V-8 engines. Large fleet operators can often save even more by installing a private fueling station. 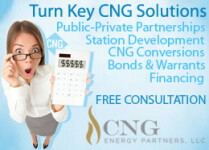 Call CNG CONSULT at 1-888-835-7424 for more information on your truck conversion.